So yeah. Not exactly optimum running weather. We picked up our packets the morning of the race, and the quick jog from the car to the entrance of the hospital where they held packet pick-up quickly convinced me to pile on even more layers than I was already wearing. I’m wearing two pairs of tights, four shirts, a vest, gaiter, earband, three pairs of gloves, and have chemical hand warmers stuffed in my gloves. Megan went with a few less layers, because she always runs hotter than I do–which I’d never thought of as cause for envy until then. After spending some time outside and feeling like we had enough clothing on, we headed back to the car to blast the heat and kill some more time before the start at 11 am. We finally dragged ourselves out of the toasty warm Sportage at about 10:40, hit the porta-potties (which is NO FUN when it’s that cold, FYI) and headed to the start. It’s really a shame we don’t have a photo from the start, with our gaiters and hoods all pulled up. I’m sure I looked awesome. My toes/most of my feet were completely numb by the time we lined up, and my fingers were starting to go numb. I pulled my fingers out of the tips of the gloves and wrapped them around the handwarmer in my palm until they warmed up, then fed my fingers back into the gloves. I ended up repeating this several times throughout the race. The race was phenomenally well-organized, and the start was great. I only had to dodge a few people before I settled into an 8:20ish pace. There were some rolling hills along the course, and I slowed a little climbing, but flew down–my Garmin showed a max speed of close to 7 mm flat was reached in every mile. At 4ish I was trucking along around a turn when I wiped out. HARD. On the knee that I screwed up this past fall. I tried to get up as quickly as I could, but man was it slippery out there. Once I started jogging away from the scene of my spill, my knee throbbed. It took me a good minute or so to loosen up and pick up speed again, but I never got back to 8:20 after that until my sprint to the end. Final time was 53:04–I thought I got in just under 53, but I missed it. I grabbed my medal, stopped to cough/sneeze/make sure my tights weren’t ripped (they weren’t!) and then ran back to cheer Megan in. Once she was done we grabbed some food and hightailed it for the car to thaw out. 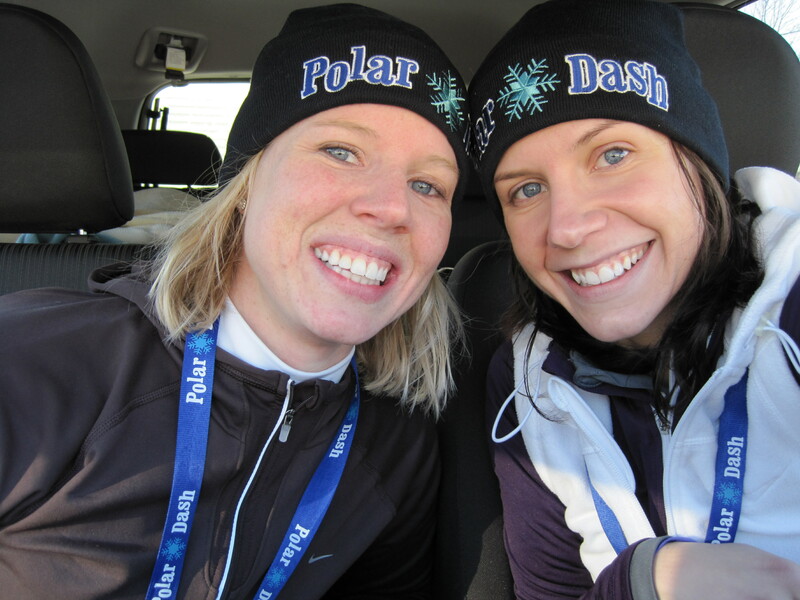 The hats were part of the race swag, and we got matching gloves too, which we both ended up wearing. 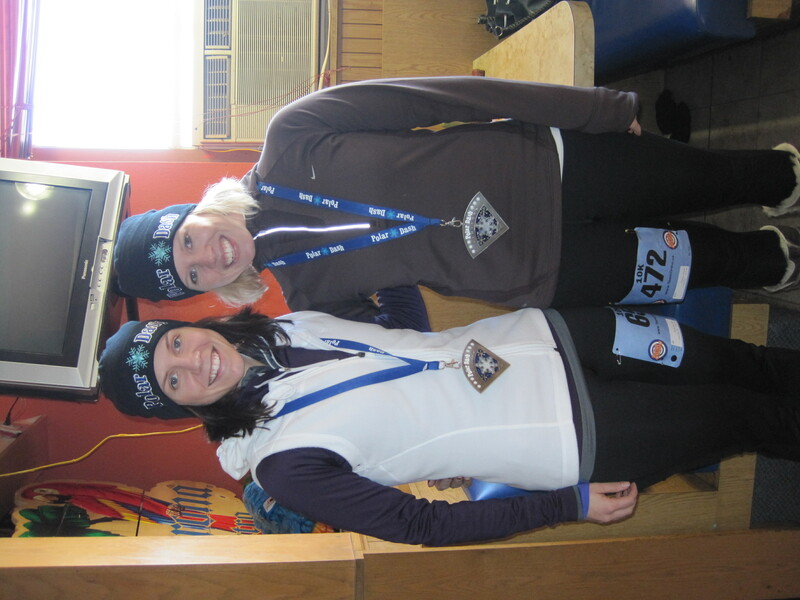 Overall, this race was actually really awesome, minus the unbelievable cold. Simply by virtue of the fact that I hadn’t run a 10k since just after I started running period, this was a pretty big PR for me–about 4 1/2 minutes. I think I could have come in under 52 if I hadn’t fallen–which makes me hopeful for what I can accomplish when it’s not so cold your snot is freezing to your face. While it feels a little badass to be able to say I did a race under these conditions, I definitely will not be returning to this one next year. It’s pretty expensive, about 4 hours from home, and it meant spending New Year’s Eve in a hotel away from my family. Worth trying, but not repeating any time soon. Also of note: I decided to give my stomach the proverbial finger the day before the race and ate sushi (which I seldom eat, and NEVER have before a race), drank diet coke with dinner, and didn’t give any of it much thought. And it was fine. This both makes me very happy and also make makes me want to scream in frustration at how careful I was before Philly. GAH. All in all, this was a (mostly!) great experience. Here’s hoping 2010 brings me many more PRs. 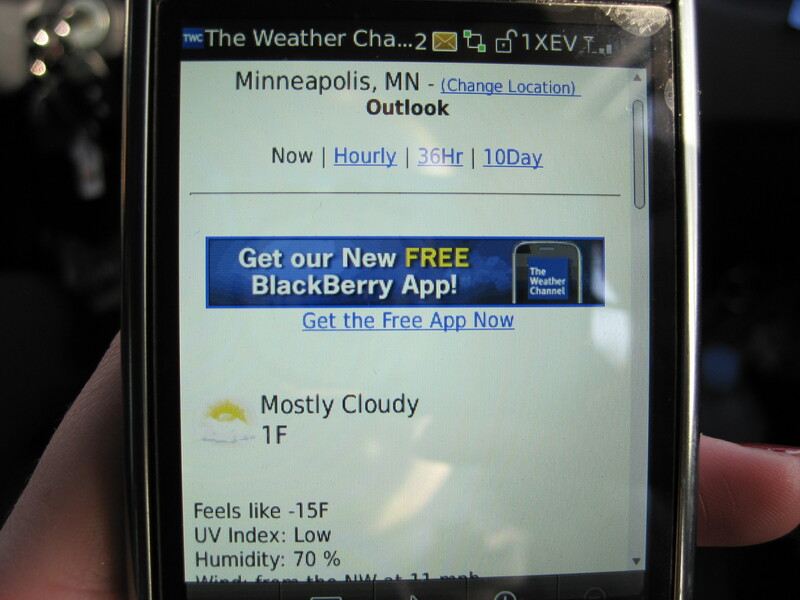 And much more tolerable race day temperatures. Great race report. Congrats on the PR. I guess the temperature was the price you had to pay to justify all that great swag. Glad you had a good time. completely, but this post gives pleasant understanding yet.